Besides all the holiday decorations and A Frozen Holiday Wish, the Magic Kingdom's most noted holiday event is Mickey's Very Merry Christmas Party. - Select days from November 8 2017 to December 22 2017. - Nightly from November 9 2017 to December 31 2017. - Part of Mickey's Very Merry Christmas Party from November 8 to December 22 2017. - Part of Mickey's Very Merry Christmas Party on event nights from November 8 to December 22 2017. - Available to park day guests from December 23 to December 31 2017, at 3:30pm. Part of Mickey's Very Merry Christmas Party on event nights from November 8 to December 18 2015 at 7:30pm, 10:05pm, 11:20pm. - Available to park day guests from December 19 2015 to December 31 2015. - Nightly from November 8 2015 to December 31 2015. - Part of Mickey's Very Merry Christmas Party from November 8 to December 18 2015 at 9:30pm. - Available to park day guests from December 19 to December 29 2015 at 8pm (without perimeter fireworks). - Part of Mickey's Very Merry Christmas Party on event nights from November 8 to December 18 2015 at 8:15pm and 10:30pm. - Available to park day guests from December 19 to December 31 2015, at 12:30pm and 3:30pm. - Select days from November 8 to December 18 2015. 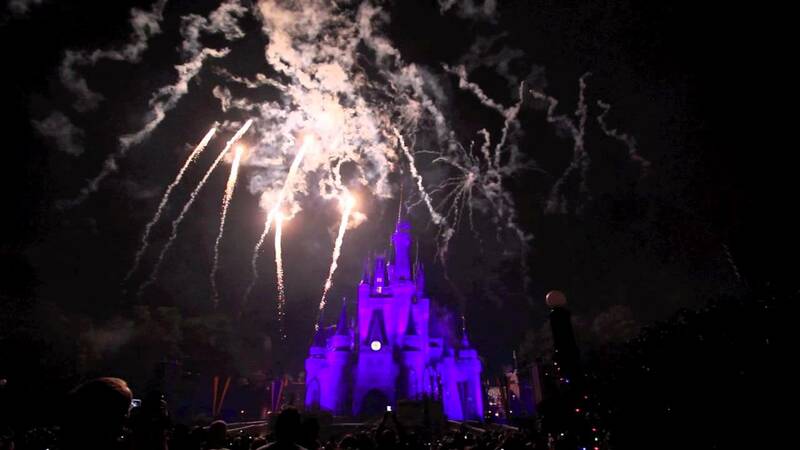 Wishes at 8:30pm Fantasy in the Sky Fireworks December 30 and December 31 20145at 11:50pm. Part of Mickey's Very Merry Christmas Party on event nights from November 7 to December 19 2014 at 7:30pm, 10:05pm, 11:20pm. - Available to park day guests from December 20 2014 to December 31 2014. - Nightly from November 5 2014 to December 31 2014 at 6:15pm. - Part of Mickey's Very Merry Christmas Party from November 7 to December 19 2014 at 9:30pm. - Available to park day guests from December 20 to December 30 2014 (without perimeter fireworks). - Part of Mickey's Very Merry Christmas Party on event nights from November 7 to December 19 2014 at 8:15pm and 10:30pm. - Available to park day guests from December 20 to December 31 2014, at 12:30pm and 3:30pm. - Select days from November 7 to December 19 2014. 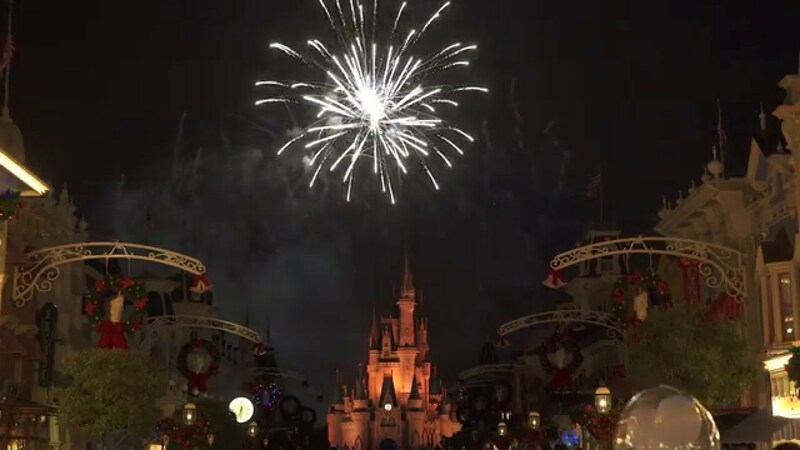 Wishes at 8:30pm Fantasy in the Sky Fireworks December 30 and December 31 2014 at 11:50pm. - Available to park day guests from December 21 2013 to December 31 2013, at 12:30pm and 3:30pm. The 2012 holiday events at the Magic Kingdom begin on November 7 2012. 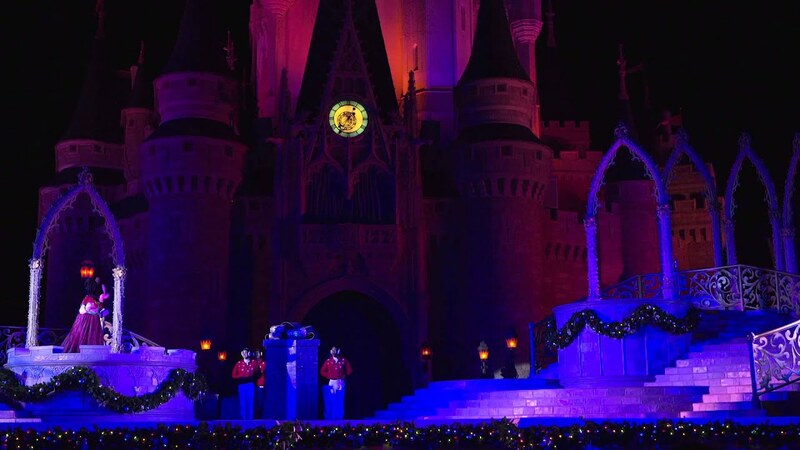 The 2011 holiday events at the Magic Kingdom begin on November 4 2011 through to January 8 2012. 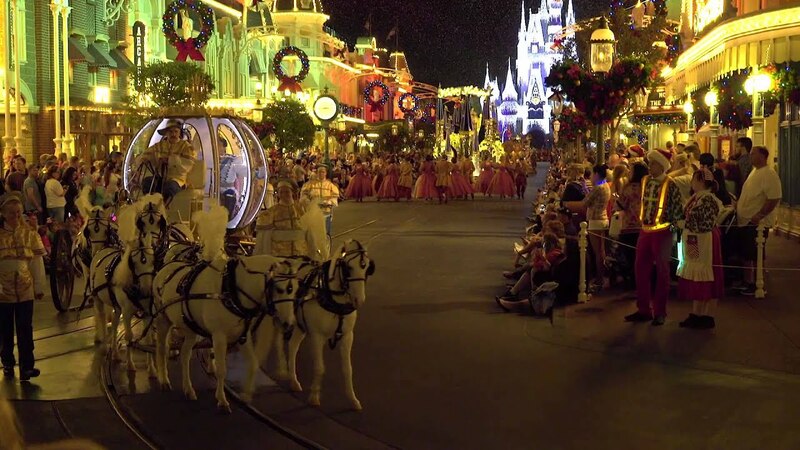 The 2010 holiday events at the Magic Kingdom begin on November 8 2010 through to January 3 2011. The 2009 holiday events at the Magic Kingdom begin on November 10 2009.